The tracks date back to the 1860s and the cars are about a century old. 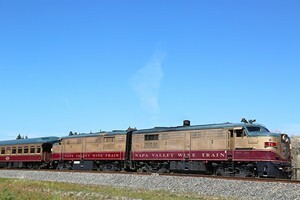 For pure bygone charm, it's hard to beat the Napa Valley Wine Train. The train runs a course some 36 miles long and passes several of the area's premier wineries—and it has long been a destination in itself for romantic meals and picturesque setting. It's also the best way to enjoy door-to-door winetasting service without having to worry about getting around.